Writing about the siege of Geok-Tepe, a contemporary reporter said "no one was spared, not even young children or the elderly. All were mercilessly cut down by Russian sabers." January 12 is usually "Memory Day" in Turkmenistan but not this year. The Turkmen authorities announced some months back that Memory Day was being merged with another somber anniversary, which annually marks the October 6, 1948 earthquake that nearly flattened the capital Ashgabat. Turkmen President Gurbanguly Berdymukhammedov did not offer any reason for transferring Memory Day, officially a holiday since 1990, but then he and his government rarely offer reasons for their actions. But there are some who feel forgetting to mark Memory Day is a nod to Russia, or rather a sign that the Turkmen government does not wish to offend the Kremlin. Some of my colleagues at RFE/RL's Turkmen Service, known locally as Azatlyk, told me that starting several years ago Turkmen officials stopped mentioning Russia specifically when speaking about Memory Day and referred instead to the "enemy." Memory Day marks a black moment in the history of the Turkmen; their disastrous defeat at the fortress of Geok-Tepe in 1881. The battle was the last major battle tsarist forces would fight against the Turkmen and the area that is now Turkmenistan would remain under Moscow's control from then until 1991. For the Turkmen, the defeat at Geok-Tepe was not simply a loss; it was a catastrophe. Tsarist forces had been steadily moving from their Caspian coast bases into the land of Turkmenistan since the early 1870s. The Turkmen at that time were nomadic raiders of the desert and had lived for centuries plundering caravans and taking slaves, including Russians who began to show up in the area in the 18th century as the tsarist army spearheaded Russia's expansion into Central Asia. Russian forces had already attacked Geok-Tepe, a fortified city of some 40,000, in 1879 but they arrived for the battle in small numbers (some 4,000) and without sufficient supplies to maintain the siege. When the Russians attempted to force the issue by launching a frontal assault on the fortress they were beaten back with heavy losses and forced to retreat into the desert to reach the Caspian Sea coast. Several hundred Russian soldiers were killed and many more taken captive, along with their weapons, in Russia's worst defeat in Central Asia since Khiva in 1717. The general who was responsible the debacle was sacked immediately and the next year fresh troops arrived commanded by General Mikhail Skobelev. Few Russians evoke such sharp emotion from Central Asians as General Skobelev. 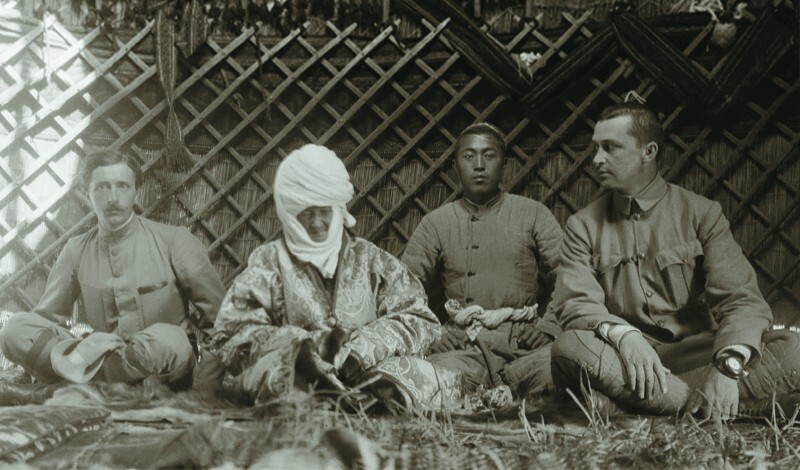 With the exception of 1877-1878 when he was fighting in the Russo-Turkish War, Skobelev had been fighting in the tsar's Central Asian military campaigns since 1868. Skobelev came much better prepared for the assault than his predecessor had in 1879 but the deciding event was on January 12, 1881 when Russians tunneled under the fortress wall and planted explosives that blew out a huge section of the defensive structure. Russian troops rushed through the breach, killing some 6,500 people in the city and then chasing down and killing some 8,000 more who fled. Edmund O'Donovan was a reporter with the "London Daily News" and witnessed what followed. He wrote, "No one was spared, not even young children or the elderly. All were mercilessly cut down by Russian sabers. In all, 8,000 of the fugitives are said to have perished, while a further 6,500 bodies were counted inside the fortress itself." O'Donovan lived in an age of Russophobia in Britain so his description is in keeping with the views of his time. However, his death toll was accurate, though later it would emerge most of those killed were males and this was by design. Peter Hopkirk in his book "The Great Game" notes Skobelev justified the massacre at Geok-Tepe by saying, "I hold it as a principle that the duration of the peace is in direct proportion to the slaughter you inflict upon the enemy. The harder you hit them, the longer they remain quiet." And here we are almost 135 years later and the government of independent Turkmenistan has decided to remain quiet about Geok-Tepe and Memory Day.